Welcome to our website. We hope that you take the time to look around our website and enjoy what Section 31 Roleplay has to offer. Here we take pride in our image and are always looking to better ourselves. We started off in June 2010 on a simple forum, and today we are more sophisticated than ever using the latest technology there is to offer. Section 31 Roleplay are always looking for new officers to join its ranks. We offer support and training in many gaming areas. We provide expert help where needed and our tutors are outstanding. 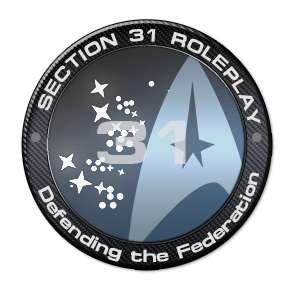 Section 31 Roleplay was created to also help its officers in game, and provide and fair, fun, and safe environment onto which any officer, regardless of age can enjoy themselves and feel like they are apart of something that is bigger than themselves. If you're a Foreign Officer (Diplomat), then please review our Foreign Policy before posting. This ensures that you know what we expect from foreign diplomats and will ensure the most efficient diplomatic relations possible. We do not use standard diplomatic means. Section 31 Roleplay is a group that have been underground for about 6 months now, and it is now time for us to expand into the world of Star Trek once more. We specialize in the games Star Trek Online and RPG-X. We have active members in both of these areas, and we regularly have events in these gaming divisions, and we also hold regular experience gaining events. In addition, we offer our officers the latest technology available so that our officers feel like that they are gaining something from Section 31 Roleplay. We have a teamspeak server, forums, email addresses, and much more we offer to our officers. Our Three Main gaming projects are; Project Dynamo which is Star Trek Online based, Project Raven which is RPG-X based, and Project Tower which is Minecraft based. We reguarly hold events in these areas, and we have dedicated officers that run these projects. A Long Time Ago, On Stardate 312504.1 (1/07/10), a new group rose from the ashes, to out-beat them all. Plasma Fusion fell apart, but 2 people said enough. 2 people, spent many hours, many days and many weeks setting up this new secret organization for the Federation. The Federation had Section 31 Born. Ensign Richard Evans, Security Officer aboard the USS Voyager, had just gotten back from his 7 year voyage. Commander Jonathan Donoue, Command Officer aboard the USS Frontier was about to be assigned to a new ship, when both members where contacted by Admiral Owen Paris that they would be the leaders of this secret organization. Both Richard Evans and Jonathan Donoue got to work. Both having to 'resign' from Starfleet. After only 1 day, they receive more and more 'resignations' from Starfleet, that they knew what to do. So, they set up the Admirals' Team. They control everything that Section 31 is ordered to do. They all maintain Starfleet's ranking system, but, with their own added twists. Sadly, Fleet Admiral Jonathan Donoue had to leave Section 31 as the Federation was threatening to cut their funding. However, a very well known officer, Fleet Admiral Samual Johnson took his place. After 1 week of Mr Donoue's departure, the federation had many 'mysterious' disappearances, and so decided that Mr Donoue should be re-instated. However, because Section 31 doesn't exist, the Federation has no jurisdiction. So, Fleet Admiral Richard Evans and Fleet Admiral Samual Johnson Decided to let Mr Donoue Back into the Admirals' Team as Vice Fleet Admiral. A Few months down the line, The Federation once again threatened it's associates by taking back all of their officers. However, Section 31 made it very clear that if any officer wishing to return to the federation may do so, but they will not be able to join Section 31 again. All members remained put, and placed the United Federation of Planets to shame. Today, Section 31 is opening its doors to many other divisions within itself, and providing many opportunities for its officers. Sadly, Vice Fleet Admiral Jonathan Donoue was taken hostage by a Klingon Faction, and taken away to a secret camp, where he was brain washed. He then was released and re-join Starfleet. He Now Serves as a Crewman. Richard is Responsible for the safe running of all servers, website and services for Section 31 Roleplay. In addition, he leads the council. Joe is Responsible for the community to move forward. Joe over sees the projects and also the events that take hold at Section 31 Roleplay. John Peters is currently holding Joe Riker's duties whilst he is on a LoA. John still holds the position of Chief of Staff.